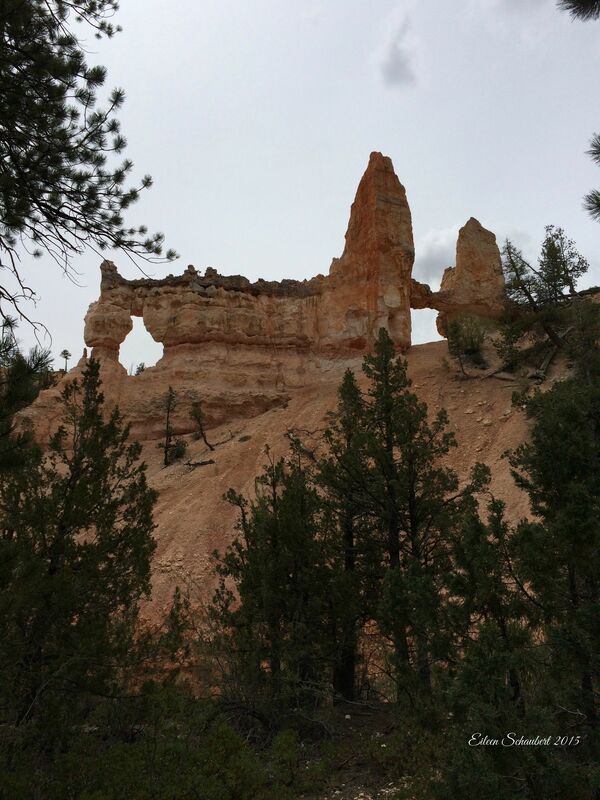 I’ve never been surrounded by so many towering hoodoos. 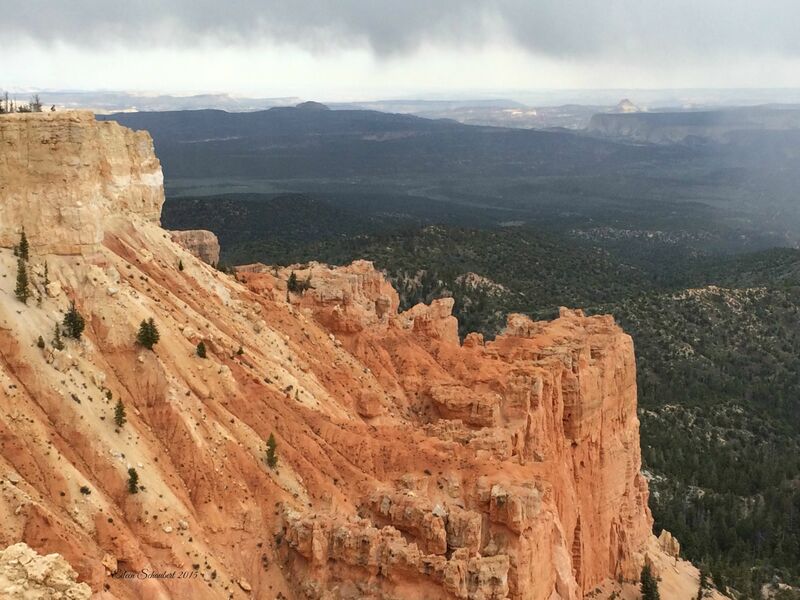 Remnants of the eroding caprock fill the amphitheater that is better known as Bryce Canyon National Park. The hikes here take you over, down, around and through these amazing rock formations. 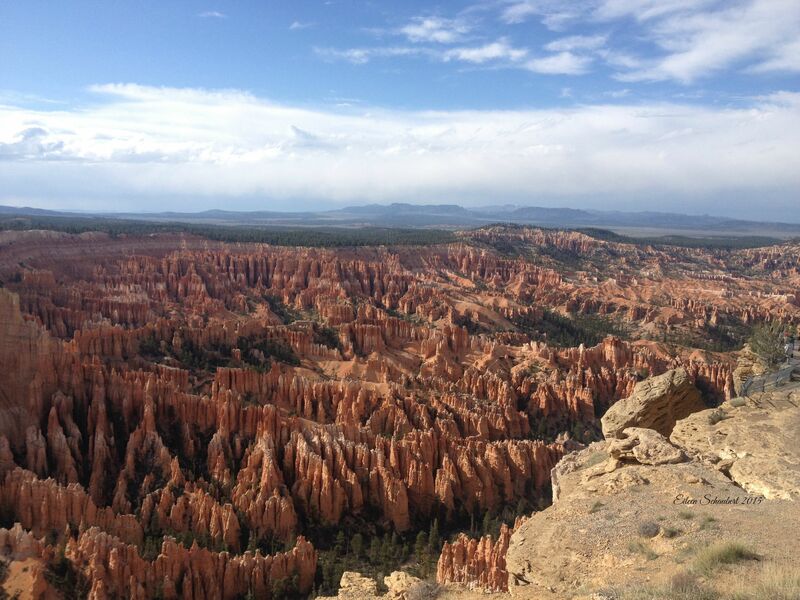 Bryce Canyon was the second stop in our swing through the National Parks. We spent two days in the park hiking; cutting the second day a bit short to backtrack for a hike in Red Valley. I found Bryce to be uniquely stunning so would rate it above Zion for a visit if you have to choose between the two parks. The starkness of the rock formations and the density of the hoodoos are what appeals to me. Although, both parks rank high for canyons that change colors with light and shadows – the oranges and reds are spectacular at sunrise and sunset all throughout southern Utah so you can’t go wrong in either place. Visiting in low season has the advantage of fewer visitors but April in Utah can still be quite cold and the spring rains rolled across the plateau on a number of days during our visit. Lots of layering options kept us comfortable throughout our stay. I’m a fan of using park shuttles to reduce the number of cars traveling through our National Parks. I’d prefer to leave that road space for those with limited mobility that can’t easily use the shuttles. Unfortunately, the Bryce shuttle only covers the front half of the park. It makes sense to run it that way due to the 18 mile length of the park road but it means that to see the southern sections of the park you must drive in. 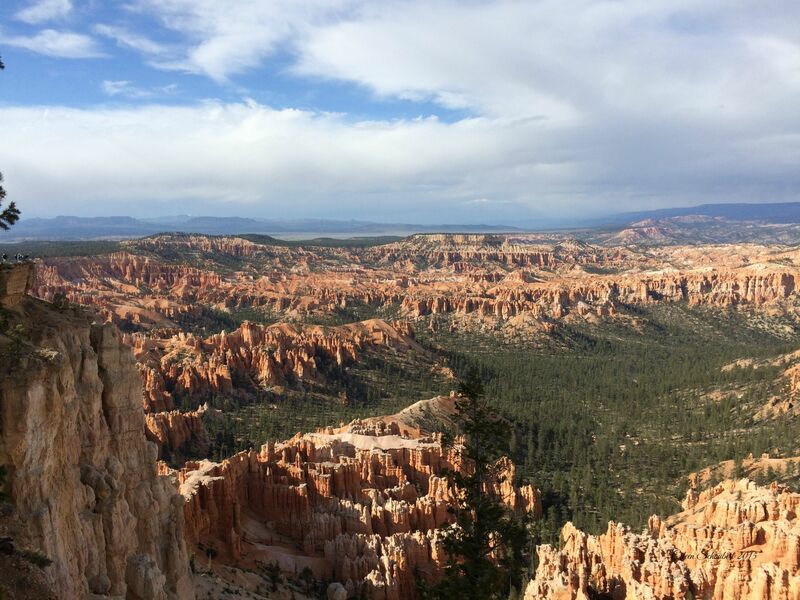 Each overlook is worth stopping at – dare I say that the National Park Service has done a fabulous job curating the Bryce experience with it’s choice of vistas and trails. We drove to the southern end of the main park road to Rainbow Point spending a bit of time there to hike the Bristlecone Loop before working our way back. 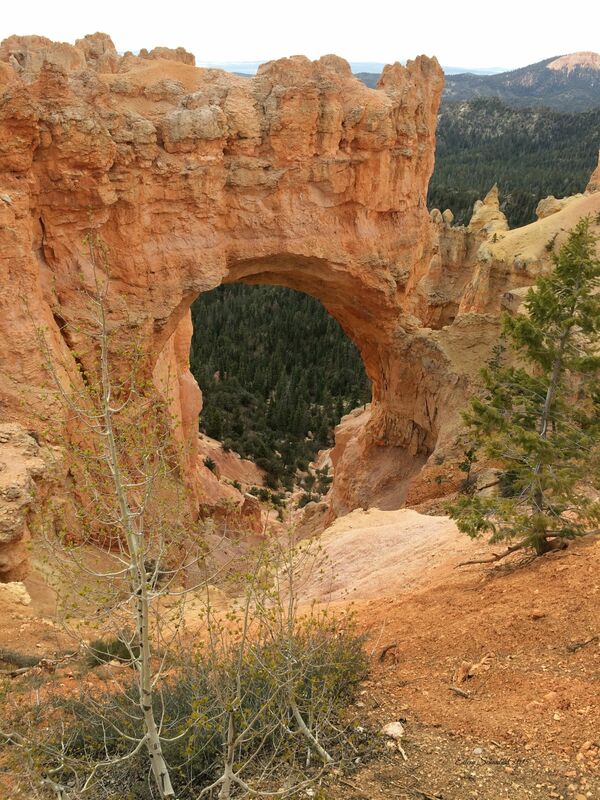 Natural Bridge is actually an arch having been eroded from the center out. At some point, the arch will collapse. 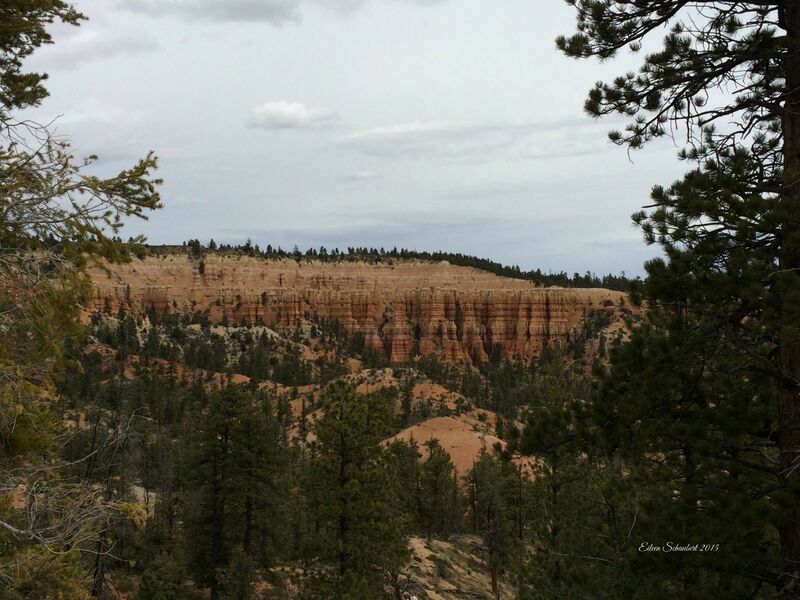 Allow time at this outlook as it serves a large span of the amphitheater and has access to the Rim Trail. It is considered to be one of the most scenic vistas. Queen’s Garden is a popular hike in the park and for good reason. 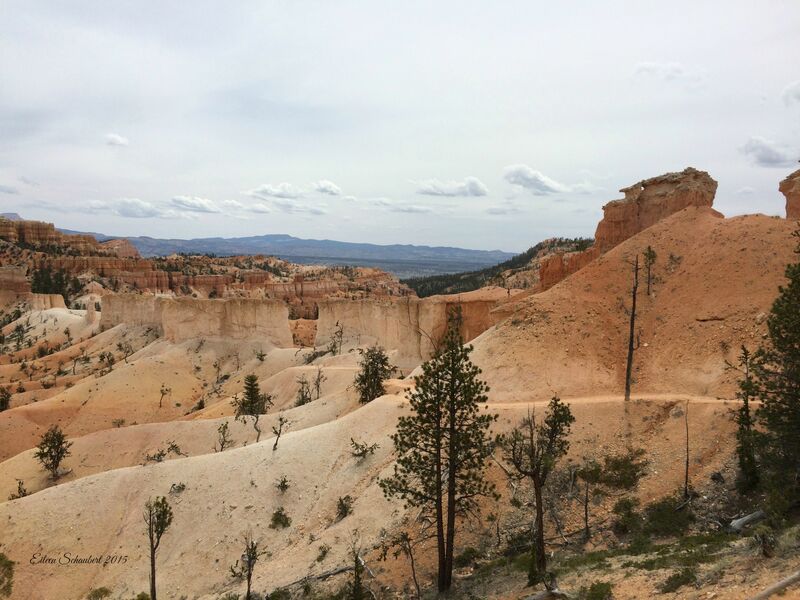 The trail is a reasonable length with moderate climbing but winds through a spectacular spectrum of hoodoos. Great photo ops are all along the trail. Other hikers were very accommodating when it was time to get photos taken; waiting out of view or offering to take over as photographer. 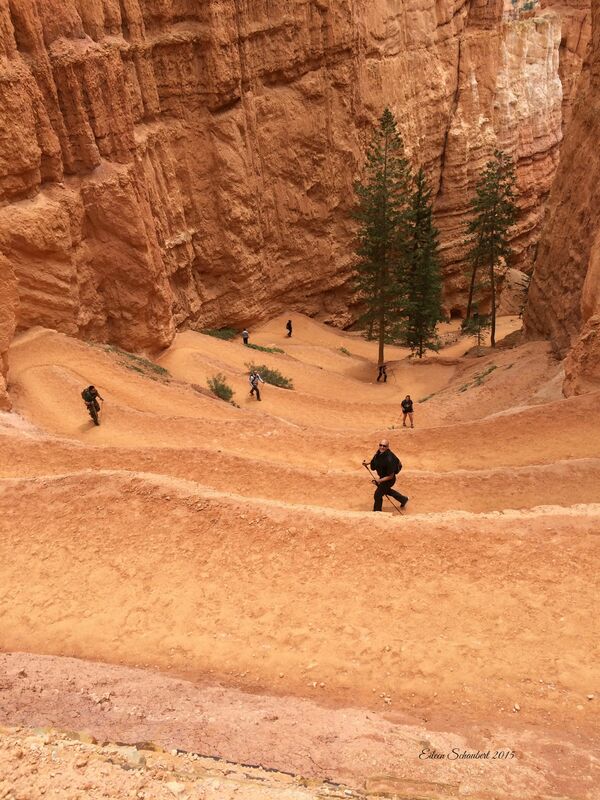 We combined Queen’s Garden and Navajo Loop Trail to create a longer loop. Parts of the Navaho Loop trail were closed for spring maintenance. This trail in particular is subject to falling rocks so it is important to pay attention to the trail conditions and heed any warning signs. This trail is another easy, relatively flat hike. 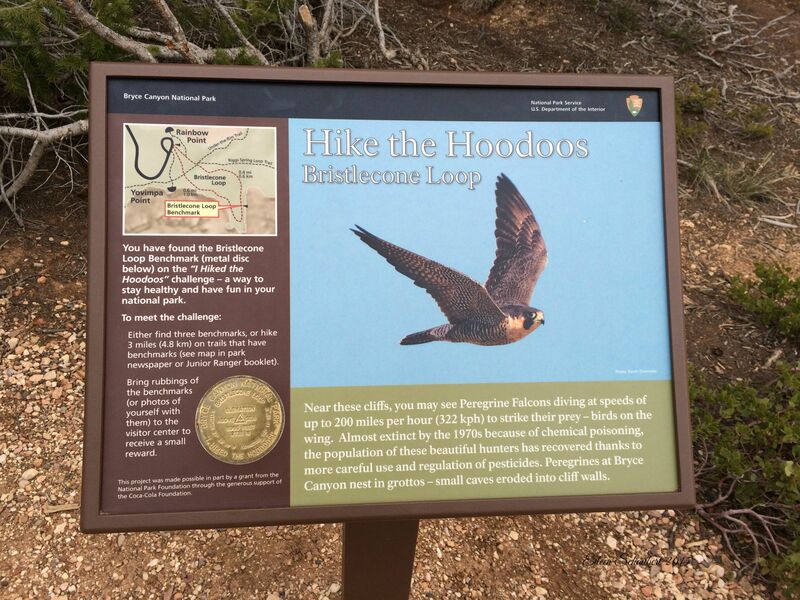 Located at the end of the park road at Rainbow Point, it can be a great way to have the kiddos burn off a little pent up energy from sitting in the car. I ran the trail while Joel was on a work conference call. The surrounding forest of pines was a distinct change from the rocky terrain in the rest of the park. Outside the main park along Scenic Byway 12 on the way to the town of Tropic, we visited Mossy Creek Trail several times. This is another trail that I ran while Joel was on a work conference call. The trail is short and has some mild elevation gain but has a nice selection of hoodoos along one side and beautiful sunsets with shadows and light playing off the walls. What looks to be a natural creek and waterfall here was actually an irrigation ditch dug to support the Mormon settlers farming in the valley below. This 8 mile hike is strenuous and takes about 5 hours. Plan ahead with plenty of water, food and sun protection. That being said, this is a phenomenal hike and can be done as an out-and-back on either end if you don’t want to complete the full loop. We started from Sunset Point and hiked counter-clockwise. Early on we met a couple from Seattle and received great advice to make sure and look back as we hiked. Vantage points from above and below change the view dramatically. 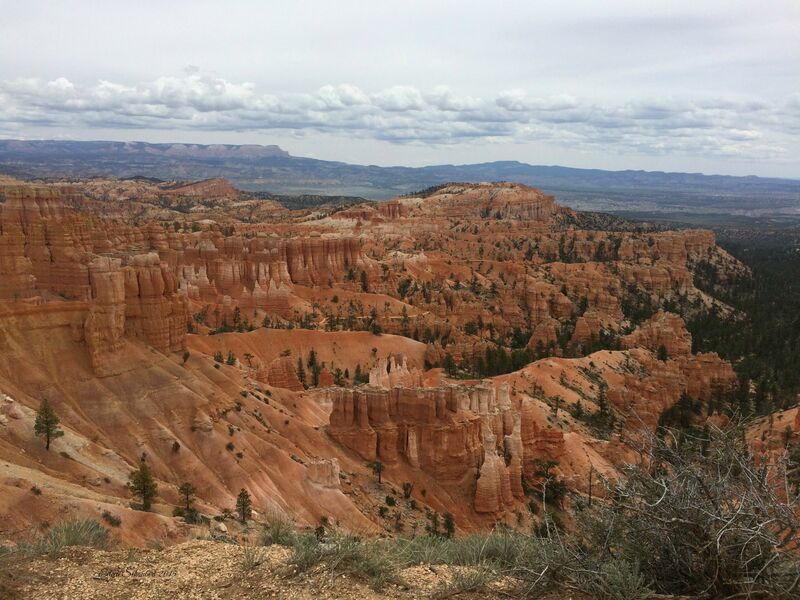 From the Sunset Point trailhead you can see the future of Bryce Canyon with rolling sands of eroded limestone. These dunes also show the color variations of the former hoodoos. Tower Bridge is a short spur trail and many hikers used it as their lunch spot. We took some snaps, ate a quick snack and hiked on. The softer sections of limestone erode leaving harder dolomite-limestone rock behind in a variety of shapes including these bridges. We took lots of photos along the way – here are just a few. Click on the gallery to see larger versions. We stayed well outside the park in the town of Tropic. The hotel costs were lower and included breakfast. The 24 hour laundromat at the hotel was a nice bonus and we made use of it. Internet and cell service was a bit spotty all throughout the area. Being this far outside of the park we missed experiencing sunrises and sunsets in their full glory due to lack of effort on our part. Choosing instead to sleep in and experience dusk near Mossy Cave Trail. If you are short on time in the park, I’d recommend focusing on the Queen’s Garden area. 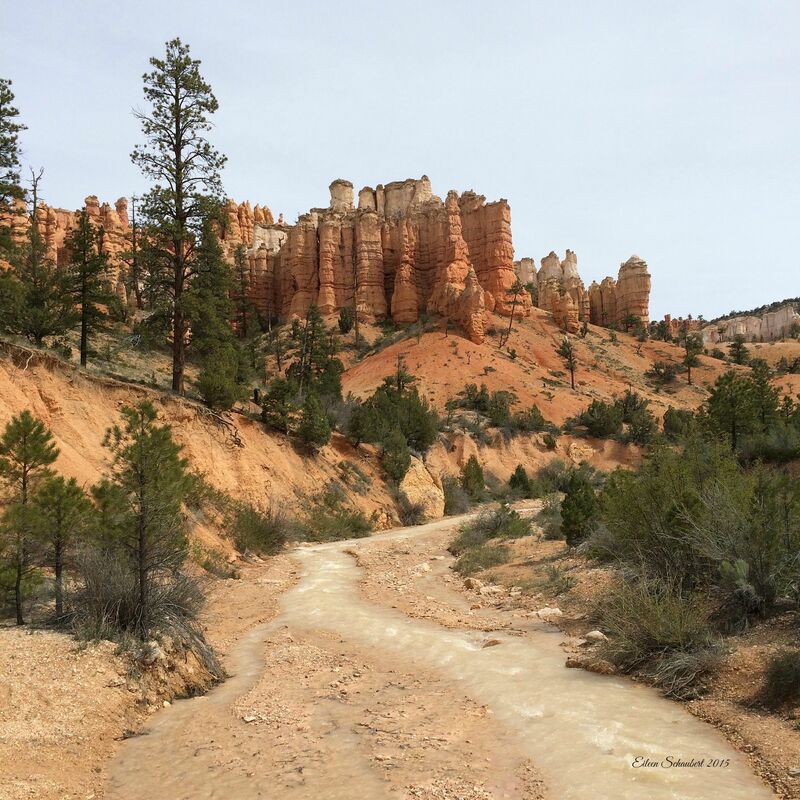 Spend more time hiking along the trails getting a close up view of the hoodoos vs seeing the variations within the park. 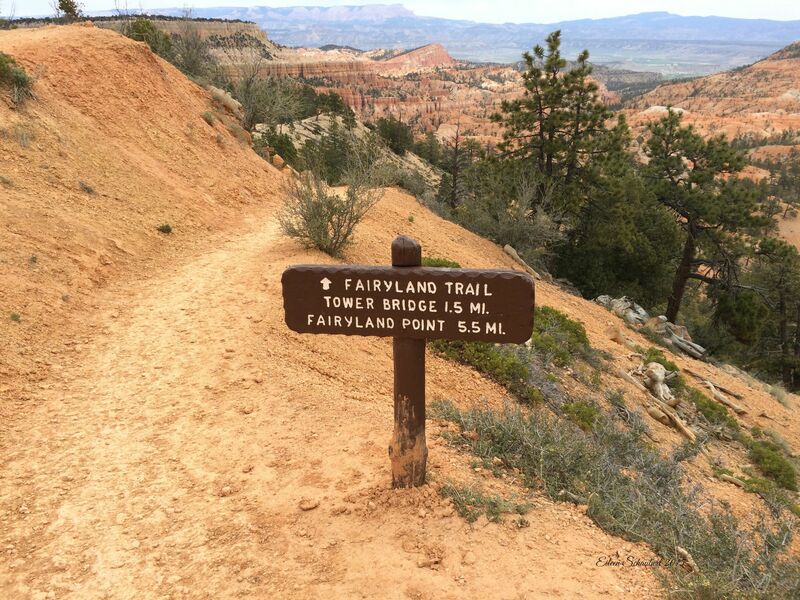 The Rim Trail between Sunrise and Sunset Point provides a more accessible section overlooking the canyon. Been to Bryce? Share your memories and tips. Check out my post on Zion National Park here and watch for upcoming posts including Yellowstone and Glacier Parks. Wow impressive pictures and well described! Thanks. My vocabulary is being stretched to go beyond awesome, spectacular and phenomenal. Amazing photos and amazing place! 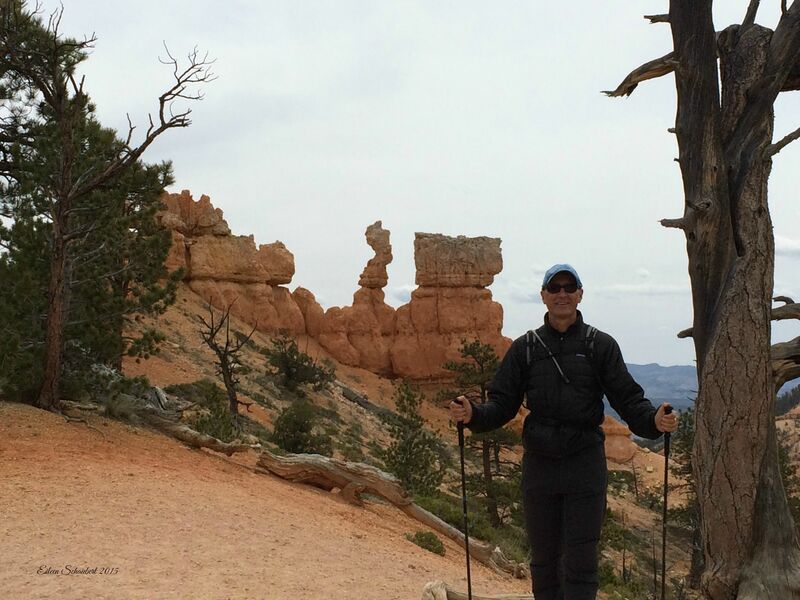 I’ve really enjoyed the summer exploring the treasures that are our national parks!